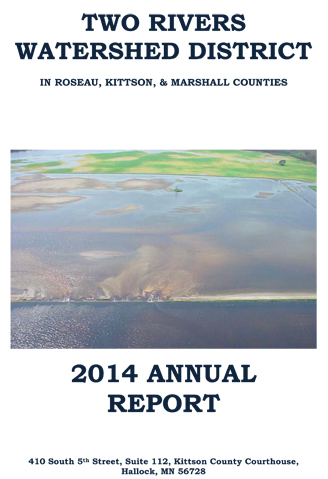 "Klondike Clean Water Retention Project #11"
The Board of Managers of the Two Rivers Watershed District would like to present this 2017 Annual Report. It contains information about the District's projects,	programs, and initiatives through the year. The Two Rivers Watershed District worked on several flood control, drainage, water quality, and other water management initiatives this coming year. Twelve regular monthly board meetings were held during the course of 2014, each on the first Wednesday of each month. The Annual Meeting was held on January 2, 2014. Two special meetings and three public hearings of the Board were held during the year. were restored to their original grade and cross section, allowing for agricultural drainage. Several other systems were surveyed to determine the amounts of accumulated sediment. 2012 was another year that presented challenges and issues with regard to water management. The year was characterized as very dry for most of the year. Data provided within this report shows that there was very little spring snow melt runoff, followed by lower than average rainfall during the rest of the year. The District was able to focus on maintenance of ditch systems in 2012. 2011 was another year that presented challenges and issues with regard to water management. The year was characterized as very wet in the first half, and then becoming very dry in the second half of the year. Data provided within this report shows that May through July were wetter than normal, but then August through December were drier than normal. Horeshoe Lake impoundment were all utilized to reduce downstream flows.